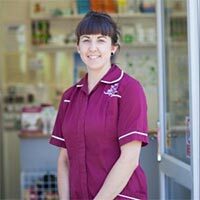 I have been working in veterinary surgeries since 2001 and became a qualified veterinary nurse in 2008. I have worked in both first opinion practices and referral centres, both in nursing and management roles, and have been a clinical coach, teaching student nurses, intermittently since 2009. My skills allowed me to traverse the globe and I worked as a vet nurse in Australia for a while. My main interests lie in surgery and anaesthesia, although I am really enjoying being an all round hospital nurse again and it is great to chat to clients in reception! I hope to give clients and their pets the best care possible and to be able to build up a great relationship with them. I am a vegan and am constantly striving to save the planet!